To address this, we used a cool statistical model known as Hawkes processes. There’s a more technical treatment in our paper, but imagine users on Reddit, 4chan, and Twitter as part of systems that are stimulated and respond by posting URLs. There are a variety of stimuli these systems respond to. From organic discovery of URLs via surfing, to seeing a friend share it on Facebook. Sometimes these systems influence each other, for example, Donald Trump posting a video from Reddit’s The_Donald on Twitter. Hawkes processes let us quantify the stimulus-response relationship between different systems, and furthermore, accounts for the influence of other systems that we do not measure, and may not even know about! 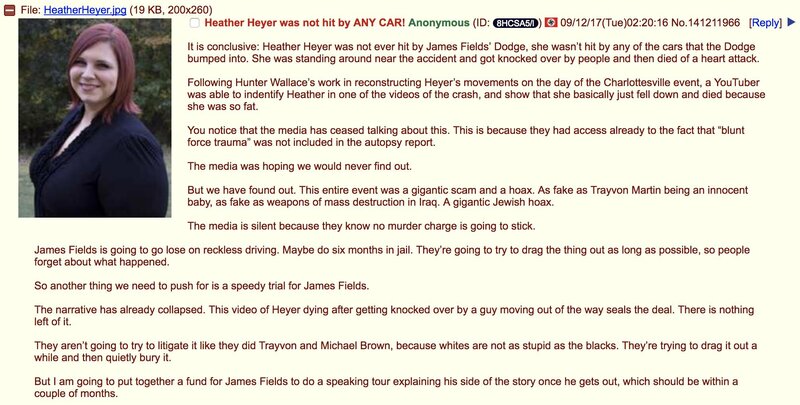 An example of what a sequence of events on a Hawkes model with three processes might look like, using The_Donald, Twitter, and /pol/ communities for representative purposes. First, an event 1 (a URL being posted) occurs on Twitter; this is caused by the background rate of the process, meaning that the URL was posted not because it was seen on any of the communities in the model, but because it was seen elsewhere (including a user finding it organically). This initial event causes an impulse response on the rates of the other processes, The_Donald and /pol/, meaning that the URL is more likely to be posted on those platforms after having been seen on Twitter. Eventually, this causes another event on The_Donald (2), which in turn causes an event on /pol/. A process can cause an additional impulse response to itself, as seen with event 3, and multiple events can be caused in response to a single event, as seen with event 4 causing events 5.1, 5.2, and 5.3. Naturally, the data we collect does not explicitly state which events are caused by other events, or which are caused by the background rate. Using Hawkes processes, we measured the influence of Reddit (more specifically, six subreddits with a substantial amount of news URLs: The_Donald, worldnews, politics, news, conspiracy, and AskReddit), 4chan, and Twitter on each other. We found that Twitter does have heavy influence on the spread of fake news, confirming concerns of other researchers and lending credence to government investigations. However, it does not exist in a vacuum, and is subject to the influence of other, lesser known “fringe” communities. 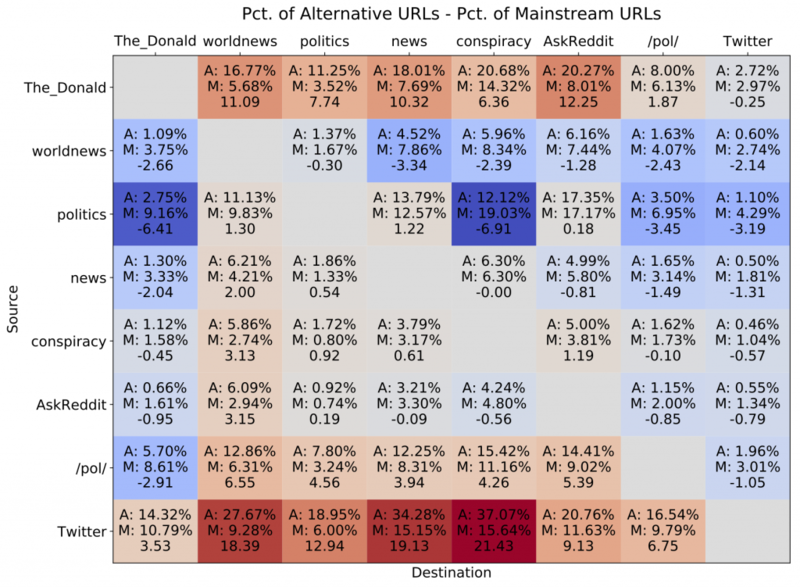 More specifically, The_Donald and /pol/ are responsible for around 6% of mainstream news URLs over 4.5% of alternative news URLs on Twitter. Keeping in mind the relative size of the communities (Twitter is several orders of magnitude bigger than 4chan or any particular subreddit), these findings are quite striking. Hawke’s processes allow us to quantify the percentage of news URLs appearing in one community that are caused by another. This table shows the estimated mean percentage of alternative URL events on a community in a given column caused by alternative news URL events from a community in a given row (A), the estimated mean percentage of mainstream news URL events caused by mainstream news URL events (M), and the difference between alternative and mainstream news (also indicated by the color). Our work is a first step toward rigorously measuring the spread of fake news and the influence of social media, but much is left to be done. We now know that these dangerous fringe communities are not confined and we cannot study them in isolation, for example, just recently misinformation from 4chan related to the Las Vegas shooting spread across the Web. Considering the increasing awareness of the impact fake news has had in influencing referendums, elections, and public opinion in general, we expect an increase in funding research trying to address it. To that end, we believe there are several specific areas that should be looked into. Machine learning models to automatically gauge the veracity of content should take into account its source and propagation path. This, of course, requires discovery and monitoring of multiple communities on the Web, which comes with a host of additional challenges. Finally, we think the research community should continue to build up our understanding of how this content is created; a deep enough understanding could allow us to adapt the strategies of bad actors as a tool against them. It’s time to fight fire with fire. 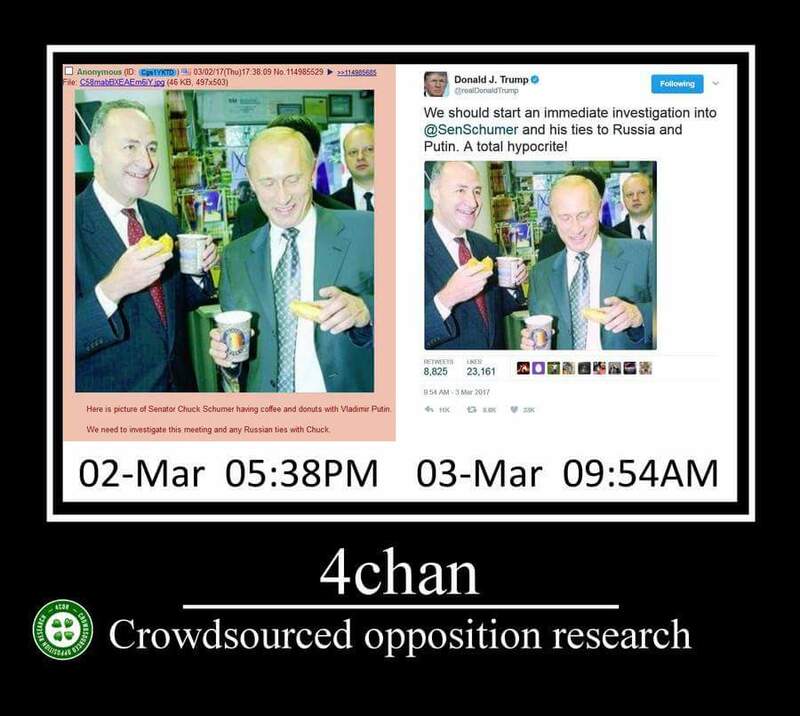 First off, 4chan != The_Donald. Second The_Donald has all sorts of content but much of it is EXPOSING the fakenews from the Main Stream Media. This site must be a soros funded hit sqaud. What a joke. Everyone I dont agree with is a (Nazi, fakenews). Most of the Fake News is liberal crap being foisted by the MSM, btw. Its truly disgusting. Thank heavens there are places on the internet where things can still be FREELY discussed. I spit on the MSM. I spit on soros bots. I look for facts and truths. Well that caused my irony meter to explode. Is this a joke post or someone being super retarded? T_D busts fake news constantly, which is what we all need with the lying MSM. A link to this story must have been posted on the sites you’re talking about. I guess now you get to experience their vitriol firsthand. Hopefully you find it useful in your research. I got it from a google news feed, due to my interest in the far right. Good blog BTW, bookmarked now. This whole story is the definition of fake news. The_Donald is one of the last bastions of true free speech and raw, unfiltered, real news you can find. The_Donald is doing the mainstream medias job for it. Why not talk about the reverse problem, where stories disappear. You worry about one person in Charlotte against how many in Vegas? Why has that story disappeared? Why, when the horrors of Libya make the news (e.g., slavery), are the authors of the atrocity (Clinton, Sarkozy, …) never mentioned? Or perhaps you blame that on Trump. People notice, and go to alternatives. You have many valuable articles on your site, but you demean it with yet another politically-motivated attack.